If you don't intend to pay for this if you win, please hit the BACK button and don't even go any further. This is an old original double sided Tydol sign, it's made of steel with porcelain and measures 30" by 30". It has several spots of missing porcelain, scratches, etc, etc, etc, but has a really cool look. I know the history of this sign dating back 45+ years, I will tell you what I know and try not to lie anymore than I feel necessary. As far back as I can remember it served as the cover of an old cistern (a hole in the ground used for catching and retaining rainwater) behind my grandma's house. She didn't use the cistern for water, she used it to dispose of broken canning jars. She lived 1 1/2 blocks from Route 66 in Conway, MO, and had moved into this house around 1970, and my guess is that the sign was covering the cistern when she moved there. 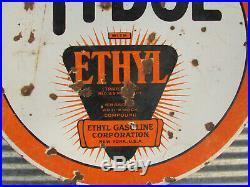 There were dozens of gas stations along this stretch of the old highway and at least one Tydol. I found a picture of that station but it had a "Flying A" sign at the time the photo was taken. But if you're the type of collector or dealer who likes to know the exact origin of an item, near Conway, MO on Rt 66 is my best guess. Seeing this as simply a Tydol Eythl cistern cover for 23 years I didn't pay any attention to it, I just wasn't thinking. My brother, being highly intelligent (that's one of the lies I warned about) and much older than me (that is true, he still is) realized what it was and grabbed it up and took off with it while I stood there with my mouth open. I then felt obligated to find something to cover the top of cistern with so that someone didn't come along and fall to their pain. Not death, but pain for sure. It wouldn't have killed anyone who fell in but they would have wished it had've. A deep hole half filled with 1000's of broken, glistening, canning jars looked like what Indiana Jones would have tumbled into if he'd been searching for ancient relics near an 86 year old woman's basement. Since then it's hung in my brother's garage, taunting collectors and dealers who wandered in and at first pretended to know nothing about until realizing that my brother wasn't as dumb as he looked he's not! That runs in the family, and then began showing him pictures of their collections on their phones. It was fun for a while but he's had enough. If I don't please contact me. See my other auctions for all kinds of weird junk! Please read the info below, if you're fairly easy going, reasonable, responsible, and willing to pay me if you win, it probably doesn't apply to you. If you're one of those folks who regularly goes to restaurants, eats the whole meal and then complains about it so that you can get a percentage off of your bill, then it might apply to you. And if your spouse curses loudly at the waitress even after you get the discount, it definitely applies to him/her too. If you're not going to pay at all, then just hit the BACK button and don't even go any further. With gas prices rising special trips to the post office cost me more and take time away from other things. This seems ridiculous to have to say, but I got a negative for not throwing in a bunch of extra stuff, lol. No I'm not kidding.. I believe I describe my items as well as I can, and if I make a mistake I will cover it. Well about once every 2 years I run into someone completely unreasonable on here, this last one was one of the worst. I have always had great feedback and will do my very best to work with everyone. But the changes made a while back have given those people out there with no communication skills a right to kill. I received some feedback quite a while back from people who, if they had contacted me first, there wouldn't have been a problem. In a nutshell, if you receive something from me and are unsatisfied, please just talk with me. Sometimes emails don't find the person they are sent to, so even call if you need to. Thanks for your good communication in advance. 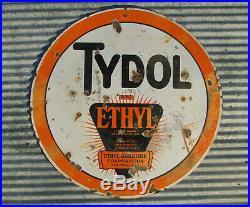 The item "ORIGINAL TYDOL ETHYL 30 PORCELAIN DOUBLE SIDED SIGN METAL VINTAGE GAS STATION" is in sale since Thursday, March 14, 2019. This item is in the category "Collectibles\Advertising\Merchandise & Memorabilia\Signs\Original\1930-69". The seller is "jopaho" and is located in Phillipsburg, Missouri. This item can be shipped to United States, Canada, United Kingdom, Denmark, Romania, Slovakia, Bulgaria, Czech republic, Finland, Hungary, Latvia, Lithuania, Malta, Estonia, Australia, Greece, Portugal, Cyprus, Slovenia, Japan, China, Sweden, South Korea, Indonesia, Taiwan, Thailand, Belgium, France, Hong Kong, Ireland, Netherlands, Poland, Spain, Italy, Germany, Austria, Bahamas, Israel, Mexico, New Zealand, Singapore, Switzerland, Norway, Saudi arabia, Ukraine, United arab emirates, Qatar, Kuwait, Bahrain, Croatia, Malaysia, Chile, Colombia, Costa rica, Panama, Trinidad and tobago, Guatemala, Honduras, Jamaica, Uruguay.